This acorn-fed pure iberico ham is tender and juicy, melting in the mouth and leaving a unique taste and intense flavour. The ham is from 100% pure iberico pigs, slaughtered older than 21 months and over 70 kg. The meat is hung for more than 40 months in barns and natural cellars for curing. 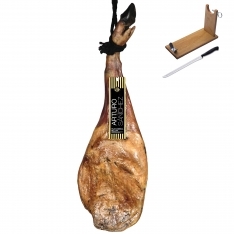 In Spanish, this product is called, "Jamón ibérico puro de bellota gran reserva Arturo Sánchez entero." 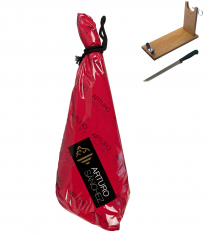 Format : This acorn-fed pure iberico ham comes wrapped in protective paper. Storage : This acorn-fed pure iberico ham should be kept in a cool, dry place, out of direct sunlight. Ottimo - Si scioglie in bocca, super. "La qualita' risponde alle aspettative, si scioglie in bocca." 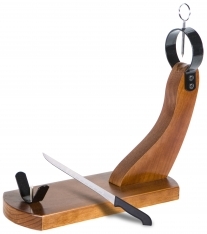 "Spedizione un po lenta, ma in compenso prodotto eccellente, come da descrizione.